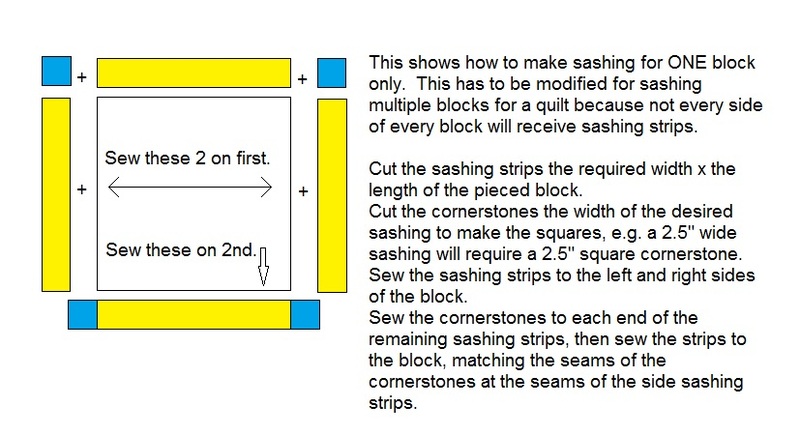 Thread: Blocks, sashing, cornerstones and seam allowances. I have just finished a quilt and now I don't understand about seam allowance. My blocks are 11 inches square. So for the side sashing I cut 11" X 2.5" strips and sewed the blocks in rows. Then I wanted to do the bottom of the blocks. I am only putting sashing/cornerstones in the middle. I cut red cornerstones at 2.5" square...and attached them to a strip of 11.5 strip. Now using my brain I thought I would just put one strip and one block to see if it lined up. Nope it was to long. so I cut .5 inch of the strip and added another 11 inch strip and it fit. So why did it all fit? I am grateful to use up the other strips I used. But I still don't understand why I didn't need a seam allowance. If the 11 inch measurement for your blocks was before you added the sashing they'd only be 10.5 inches after. That would mean an 11 inch strip plus cornerstones would be what you'd need for the bottom sashing. Thanks Jan for the visual. Always easy to see.